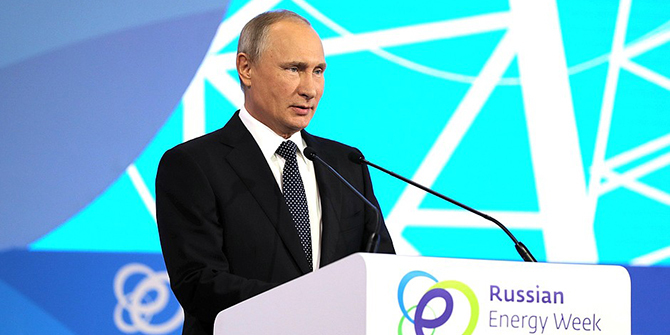 President Putin speaking at the first Russian Energy Week Forum. CC 4.0 kremlin.ru. Discussions of Gulf Cooperation Council (GCC)–Russia relations have been dominated by their diverging approaches regarding Syria and Iran since 2011. When it comes to Russia, however, the Gulf states have, at least historically, produced relatively similar foreign policies focused primarily on economic engagement, rather than on the development of a long-term strategic relationship; their relationship with Russia being more instrumental than fundamental. As such, this piece focuses on three primary dimensions of GCC–Russia relations: investment, energy and Islam. Securing investment in Russia’s economy from the Gulf is a high priority for Moscow. This interest in seeking investment from countries on both sides of the Gulf crisis has been one of main factors driving Russia to maintain neutrality in the diplomatic row. Nonetheless, many of these investments have, at least at this point, only been promised rather than fulfilled. Qatari investment into Russian infrastructure, however, seems to be more advanced than that of neighbouring states. Indeed, assets of the Qatar Investment Authority (QIA) in Russia are valued at more than $2.5 billion. QIA has a $500 million stake in leading Russian bank VTB and a 25 percent stake in Pulkovo Airport in St. Petersburg. Additionally, QIA has invested a staggering $11.3 billion in Russia’s Rosneft for upstream projects, and logistics, which accounts to one-fifth of Rosneft’s privatization portfolio. Sheikh Hamad bin Jassim bin Jaber al-Thani, former Prime Minister, Foreign Minister and CEO of QIA, is also a board member of the Russian Direct Investment Fund (RDIF), Russia’s sovereign wealth fund. Emir Sheikh Tamim bin Hamad al-Thani’s recent visit in March 2018 to Moscow also resulted in an announcement from Qatar Airways that it will buy a 25 percent stake in Moscow’s third largest airport, Vnukovo. Meanwhile, Abu Dhabi Investment Authority (ADIA), has at least committed to the investment of billions of dollars in infrastructure and industry through the RDIF. DP World, Dubai’s ports operator, has agreed to launch a joint venture with RDIF and is believed to be considering investing in a large port in Vladivostok as of January 2018, however, no deal has been reached according to DP World chairman. In December 2017, Mubadala Investment Company also committed investments of up to $6 billion in renewables, infrastructure, and transport, yet again it is unclear what has actually begun on the ground. For its part, Saudi Arabia’s Public Investment Fund (PIF) agreed in 2015 to invest $10 billion in a general investment programme with the RDIF in the areas of infrastructure, retail, logistics and agriculture over five years. This was the largest foreign direct investment in Russia at that time. In October 2017, at the Russian–Saudi Investment Forum (also the occasion of King Salman’s first visit to Russia) Saudi and Russian companies signed investment deals worth more than $3 billion. All the plans are quite impressive and ambitious, but are yet to be implemented. Furthermore, although trade with Saudi Arabia mounted to an $124 million and $296 million with the UAE, Russian trade with Iran still remains far more important, amounting to $398 million over the same period. Another shared economic interest between Russia and the GCC lies in the global oil and gas markets. For the first time since 2001, Russia collaborated with the Organization of Petroleum Exporting Countries (OPEC) on the joint oil production cut in December 2016. As of January 2018, Russia and OPEC confirmed that the cuts would last throughout 2018 and that Russia would cooperate with OPEC even after these cuts. Qatar, Russia, and Iran enjoy the world’s largest natural gas reserves, making them somewhat natural energy partners. Indeed, they are the main backers for the creation of a so-called ‘GASPEC’, which Saudi Arabia, the UAE and the US oppose. Nonetheless, news surfaced earlier this month that Russia and Saudi Arabia, encouraged by success gained through cooperating through OPEC, may reach a new energy agreement on liquefied natural gas (LNG). Putin has prioritised the expansion of Russia’s LNG production, while the Saudis hope to double their own gas production in the next decade, which could potentially put the Russians at odds with Qatar. After the Qatari Emir’s recent visit to Moscow, however, it seems likely that the partnership between Qatar Foundation for Education, Science, and Community Development with Rosneft could lead to joint research into the energy industry. Perhaps the most interesting and least discussed aspect of the GCC–Russia link is a shared interest in squelching Islamist influence, particularly on the UAE’s part. Although Russia is maintaining neutrality in the Qatar crisis, the accusations made by blockading countries about Doha supporting Islamist movements, were also made by Moscow at earlier stages of the Syrian crisis. The Grozny Conference in September 2016, hosted by Chechen leader, Putin friend and self-proclaimed Sufi Ramzan Kadirov, brought together some of Sunni Islam’s most influential leaders to define what it means to be a Sunni. It was co-organised by Abu Dhabi-based Tabah Foundation, the sponsor of the Senior Scholars Council, which aims to recapture Islamic discourse from Saudis as well as to counter Muslim Brotherhood ideologue Sheikh Yusuf al-Qaradawi’s Doha-based International Union of Muslim Scholars. James Dorsey aptly describes this event as demonstrating ‘successful behind-the-scenes manoeuvring by the United Arab Emirates to counter Salafism despite the UAE’s close collaboration with Saudi Arabia […] It also shines a light on Russian efforts to cultivate Muslim religious leaders.’ Interestingly, and quite tellingly, the conference excluded Wahhabism, Salafism and Deobandism from its definition of Sunni Islam. Despite this oversight, just months after the conference, in November 2016, then-Deputy Crown Prince Mohammed bin Salman welcomed Kadirov to the kingdom, where he visited the Prophet’s Mosque in Madinah. Such events suggest Russia’s sympathy with the Emirati and Saudi approach towards Sunni Islamists, who are considered fundamentally politically dangerous. Despite this shared ideological approach, however, Russia has not wholeheartedly backed the Emirati and Saudi stance when it comes to isolating Qatar. Courtney Freer is Research Officer at the Kuwait Programme, LSE Middle East Centre. Her academic work focuses on the domestic politics of the Arab Gulf states, with a particular concentration on Islamism. Her book, Rentier Islamism: The Influence of the Muslim Brotherhood in Gulf Monarchies will be released in May by Oxford University Press and examines the socio-political role played by Muslim Brotherhood groups in Kuwait, Qatar and the UAE. She tweets at @courtneyfreer.